Pave the way for rapid progress. Don’t let bottlenecks and slow approvals bog you down. With BambooHR’s custom statuses and workflows, you can streamline your decision-making processes and protect the integrity of your data. 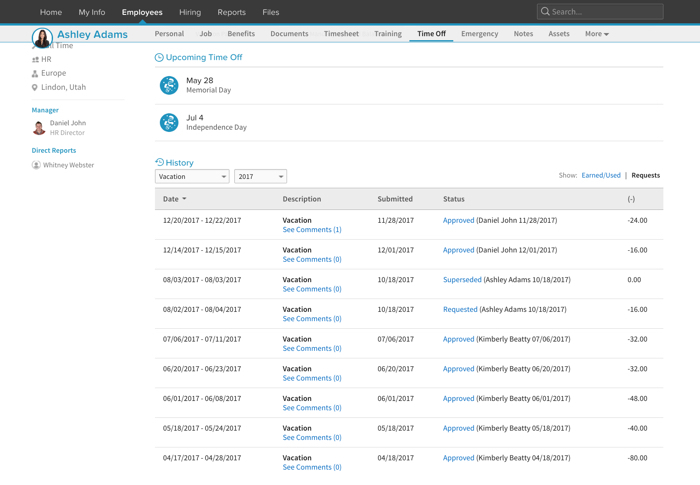 We make it easy for you to set up and optimize your most common workflows, from approving time-off requests to updating employee information. Full steam ahead! Put bottlenecks in the guillotine. 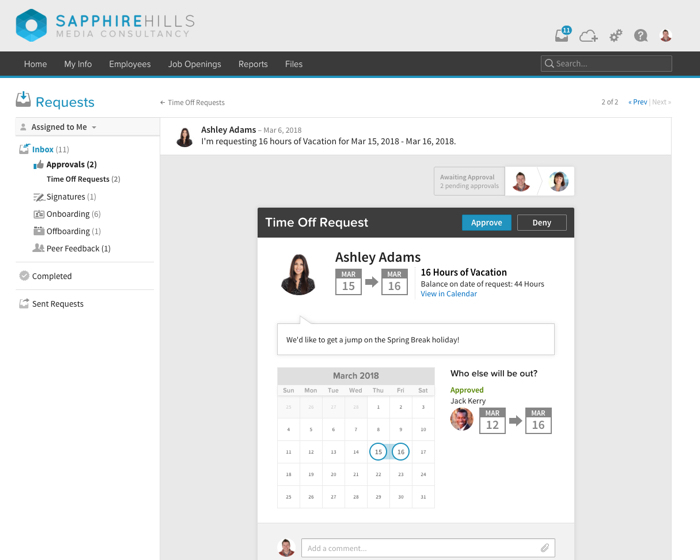 Revolutionize your approval process with a seven-day free trial of BambooHR. Love doing all the work yourself? Of course not. Delegation is the HR professional’s best friend. 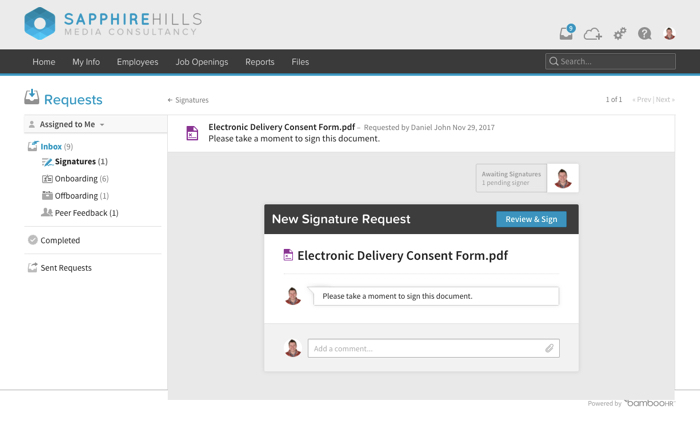 Custom workflows help you share the load for approvals and data entry so you aren’t stuck with a long line of employees outside your door or a big stack of forms on your desk. When you automate and delegate your approval workflow activities, you’ll save time and gather what you need more quickly. You can even assign people to fill in their own information, ensuring the data going into the system is as accurate as can be. You don’t have to go it alone anymore—it’s time to start working as a team. We protect your important data. To err is human. But when it comes to handling sensitive information, BambooHR helps keep your data safe and accurate with custom statuses and simple workflows. And that’s divine. 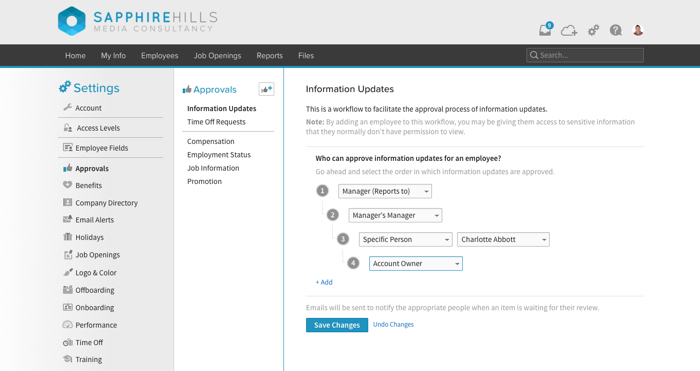 You can assign up to five different people to approve changes in workflow data, whether you’re updating employee phone numbers or finalizing a promotion. 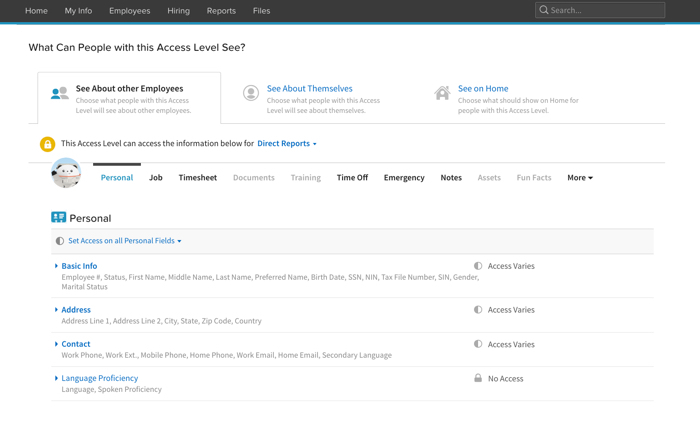 You can even customize each person’s access level so only the right people can make edits. No need to worry about inaccuracies—we’ve got you covered. Keep track of approval workflows. Every workplace has that one person with a perpetual stack of approval forms piled up on their desk, delaying countless company decisions. And it always seems to fall on you to get them back on track. We feel your pain. That’s why we make it easy to track approvals from inside BambooHR so you can see exactly where the holdup is. Requesters and admins can check the progress bar to see which workflow activities have been completed and who has (or hasn’t) submitted their approval, taking the responsibility off of you and putting it where it belongs, once and for all. Are your top employees waiting forever for management to approve raises and title changes? That’s a recipe for turnover. Delay important decisions like that for too long, and your employees may not stick around to wait. 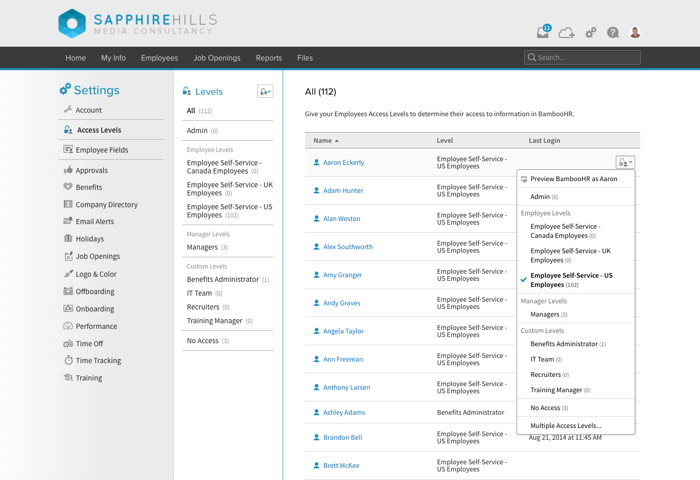 BambooHR lets you create an organized and streamlined process for each of your most common workflows. In just a couple of clicks, managers and administrators can approve or deny any requests, which means more rapid decisions and greater retention. Employee self-service empowers your people. Nobody likes hounding employees to update their information. And the employees getting hounded are likely tired of it, too. That’s why BambooHR includes employee self-service—to take the burden off of you and give power to your people. Employee self-service empowers employees to check and update their own information without your help. You can even include managers and supervisors in the approval process so everyone stays in the loop. This means less time managing paperwork and more time taking care of peoplework. It’s time to be strategic. Imagine how much time you could save simply by optimizing your most common workflows. When hours of chasing paper are reduced to a few clicks, the opportunity to step up to the strategic plate for your organization becomes real. Instead of tracking down approvals, you can leave the busywork behind and focus on important issues like employee engagement, retention, talent development, and more. Now is HR’s time to shine. BambooHR can pave the way. Want to learn more about BambooHR? There's no substitute for hands-on experience. Try it yourself—free for seven days.